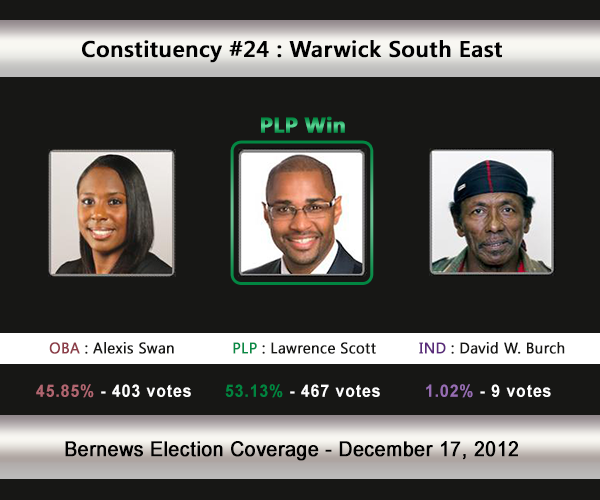 [UPDATE Dec 17: Election Results] Lawrence Scott [PLP] has defeated Alexis Swan [OBA] and David William Burch [IND]. Former Premier Alex Scott presently holds this seat, and his retirement has resulted in his son Lawrence Scott being selected as the PLP’s candidate. Mr Scott Jr will be challenged by another young political newcomer, with Alexis Swan standing for the One Bermuda Alliance. In the 2007 General Election Alex Scott won 58% [518-367] of the vote vs the UBP’s Jeff Sousa. In the 2003 General Election, Mr Scott won with 55.80% of the vote against Bob Richards [UBP] who received 44.20%. 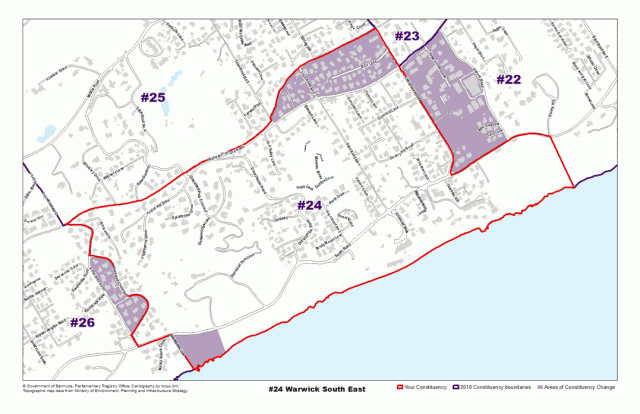 Areas the Warwick South East constituency compromises of, or is located by, include the Railway Trail, Tribe Road No. 2, Ord Road, Harvey Road and Rocklands Road. William Lawrence Alexander Scott, the PLP candidate for Warwick South East, has been inspired by his family to continue their long tradition of community service. His community service includes volunteering with the St. Johns Ambulance as a ‘First Responder’ and Trainer; Memberof Alpha Phi Alpha Fraternity Inc; counselor at the Boys Club and also gives motivational speeches to students on a regular basis. He is the Co-Founder of The Airborne Foundation, a registered charity that seeks to provide educational opportunities for young Bermudians that want to pursue a career in the aviation industry. Alexis Swan grew up in Warwick and has family there still. Alexis Swan is a young professional woman who wants to help get Bermuda working again. She particularly wants to help young Bermudians find a voice in politics. After graduation from university in the US in 2008, Alexis came back to Bermuda and joined Colonial Insurance, where she works as a Medical Administration Auditor and Account Representative. She has worked as a volunteer at Harbour Lights, helping recovering addicts improve their reading skills. She has also worked, part time, at the Sunshine League. Public service has become part of her life, hence her decision to become involved in politics. “I believe politics should be about uplifting people. I believe it should be about appealing to their best instincts and values in order to build something better. The OBA has creative solutions to address Bermuda’s problems. “I joined the One Bermuda Alliance because it brings something new to the scene – a new, diverse coalition of Bermudians who really want this country to do well. “I believe in the OBA’s commitment to forming a government based on positive values and principles – such as honesty, transparency, cooperation, selflessness, responsibility and public service. This is the kind of foundation on which we can build real unity and fairness into our daily lives.